Lecture held in conjunction with the SBMA exhibition "Bamboo, Rocks, and Old Trees: Chinese Calligraphy and Literati Painting." 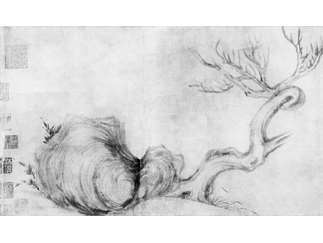 In November 2018, Su Shi's (1037–1101) "Old Tree, Rock, and Bamboo," one of the most famous Chinese paintings "never seen" suddenly emerged into public view and sold for an extraordinary sum of money at a public auction in Hong Kong. Peter Sturman, Professor of Chinese Art, Department of History of Art and Architecture at UCSB, recounts the importance of this singular painting and presents new research that helps shed light on the very beginnings of what is known as literati painting in China. Behind the quirky image of Su Shi's twisted tree and strange rock is a sophisticated iconography that draws from ancient philosophical ideals and communicates with the artist's closest friends. Su Shi's work represents the start of a longstanding tradition of painting by scholar-officials that came to dominate much of China's recent history, and its indirect influence in works of art produced in late imperial China and modern times. Image: Su Shi, Chinese, 1037-1101, "Old Tree, Rock and Bamboo" (detail). Ink on paper; handscroll. Private collection.